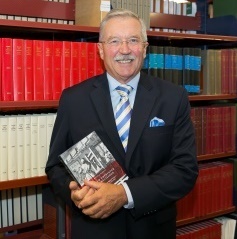 District Court judge and university law lecturer David Harvey has another string to add to his legal bow, with his PhD being published as a book. The Law Emprynted and Englysshed – sub-titled The Printing Press as an Agent of Change in Law and Legal Culture 1475-1642 – has been printed by leading legal publisher, Hart Publishing of Oxford. The book examines the way in which law printing developed in the period from 1475 up until 1642 and the start of the English Civil War. “Some consider it to be all about censorship, but I don’t think it was. I think it was about the printing industry itself trying to stop unauthorised people getting into the business. The issue was not censorship but industry control. “Some early writers saw the change from manuscript to print as beneficial, others didn’t. There was a coterie which preferred sharing hand written notes and considered there was a stigma attached to print. Harvey completed his PhD over seven years part-time while serving full-time as a District Court judge and part-time as a law lecturer at the University of Auckland. The PhD began as a plan to research and write about his specialist field of information technology and its effect upon the law. Harvey told NZLawyer that he finds the whole purpose of the law as an inspiration. He attributed his ability to juggle working as a judge and law lecturer while completing a PhD to good time management. What would you say is the main thing that motivates or drives you in your work? You are obviously an extremely busy person – what do you do to unwind? Is there any piece of advice you’d give to budding young lawyers who aspire to you?